Sample recipes for the "21-day Health and Weight Recovery Challenge"
As I mentioned in the "21-day Health and Weight Recovery Challenge", I'll be putting up some samples of recipes on this web page. So here are a few for starters ... make variations of these with your own combination of ingredients from the "Foods to Delight" list. Cook in the same pan adding a small amount of oil and butter, over medium heat for a few minutes until the underside is golden. Adjust amounts as you wish but make sure to use lots of vegetables. If you make it for 2 just double the veggies and use 2 eggs instead of 1. Or if you find a whole egg is too much for 1 person, use 1 egg for the 2 person dish (that's what I usually do). Make your own favorites using any combination of ingredients from the "Foods to Delight" list. 1/2 can of drained good quality tuna in water with 1 tbs low fat, organic mayonnaise, lemon juice to taste and a tsp of dill herbs... spoon over the salad as you want. For 2 people, double the salad and use the full can of tuna. 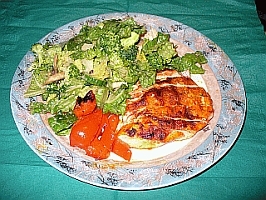 Use your own combination of vegetables and fish or cooked and cubed chicken, etc... from the "Foods to Delight" list. Serve on a plate and add the salmon. Again adjust for 1 or 2 persons. Use your own combination of vegetables (raw or cooked) and fish or cooked and cubed chicken or lean steak... from the list of "Foods to Delight". The 21-day health and Weight Recovery Challenge"